Searching for Solidity in the Digital. The video i-Glitch explores ideas about online identity and error. “The glitch became my identity”. This image is still my profile picture on Facebook and other on line sites. As an experiment a Laser Cutter, and I burnt the Glitch image into an old roof slate. 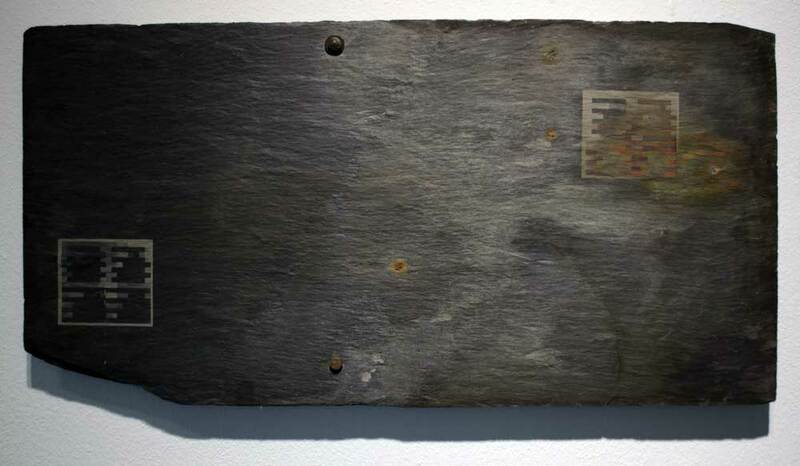 The slate had layers of rust from the original nail, these were revealed in the cutting process. This created a solid sculptural object from the purely digital. In December 2015 I decided to make a permanent record of the Glitch on my skin with a tattoo. Error recorded during video capture. Displayed at the O3 Gallery in Oxford in January 2012.